The CryoFacial™ is a Cryogenic treatment, in which a controlled beam of vaporized liquid nitrogen is used to freeze the skin of the face, scalp, and neck area. The CryoFacial™ is truly one of a kind. The cold nitrogen produces an instantaneous tightness in the skin, filling in fine lines and wrinkles. Collagen is activated to produce more cells, causing skin to become more elastic over repeated use. Additionally, skin’s pore size is reduced, keeping toxins, dirt and grime out. The CryoFacial™ flushes away built up toxins in the skin and soothes inflammation, eliminating dreaded puffiness. *Disclaimer: Information contained within this website and on all printed material offered by our company is for informational purposes only. 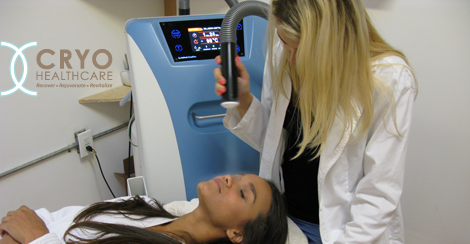 Under no circumstances CryoFacial may be considered as a medical procedure. CryoFacial is not to be used as a form of treatment for any illness or disease without direction from a qualified health professional. All material contained within this site is copyrighted. All rights reserved. Contact us for permission to reproduce. This equipment has not been tested or approved by the FDA or any other government agencies. No warranties express or implied. Any use is at your own risk. Results may vary person to person.